Compact diesel engines burn up to 90% less fuel than most diesel service trucks. Prevents unnecessary wear on vital chassis components. Installation is fast and simple. Complies with anti-idle laws in most states. Sound level 84 dB at low speed 87 dB at high speed. Twister's compact Diesel meets strict Tier 3 emissions. C.A.R.B. certified. Fuel Consumption 1.6 liters per hour / 0.42 U.S. gallons per hour under 100% service. Up to 90% savings. Using Airworks' cold weather package, tying into your chassis, eliminates any cold start issues by circulating coolant through the cooling system. Reduce Installation time. Standard mounting of Airworks compressors takes approx. 2 hrs. 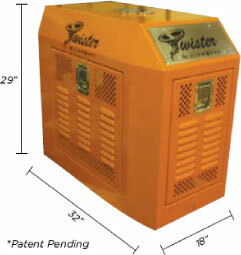 Twisters were designed not only for ease of installation, but also to make the transfer to a new chassis simple, resulting in reduced down time, and expense. Extended service intervals on your truck. Hook up fuel line to chassis tank. Glow Plugs & Electric Fuel Shut Off.